Vasatka, Genevieve B. - Groelle & Salmon P.A. 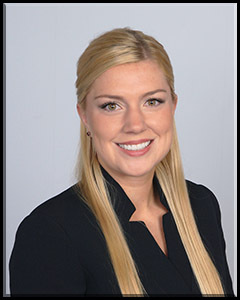 Genevieve Vasatka is an associate attorney focusing on insurance coverage and defense in the firm’s Orlando office. Genevieve’s studies focused on litigation and advocacy during her attendance at the #1 ranked law school for trial advocacy, Stetson University College of Law. In law school, she served as a state judicial intern for the Honorable Jack Helinger of the Sixth Judicial Circuit of Florida, and was a student editor of the Journal of International Wildlife Law and Policy. Genevieve worked throughout law school as a law clerk in civil law and litigation, including personal injury law and foreclosure disputes. In her free time, Genevieve volunteered as a student drafter for the National Clearinghouse for Science, Technology & the Law, and assisted families prepare their tax returns as a volunteer for the IRS’s Volunteer Income Tax Assistance Program. Along with receiving her Juris Doctor, Genevieve earned a Certificate of Concentration in Advocacy and a Certificate in Leadership Development. After law school, Genevieve gained extensive courtroom experience as an Assistant State Attorney for the State of Florida, having tried sixteen jury trials and numerous evidentiary motions. Prior to joining Groelle and Salmon, Genevieve represented carriers in complex first-party insurance coverage disputes as an associate with a well-known defense firm. Genevieve has continued to devote her advocacy training and experience to representing carriers in insurance coverage litigation at Groelle and Salmon. Genevieve is admitted to practice law in all state courts in Florida, as well as the United States District Court for the Middle District of Florida. Genevieve received a Bachelor of Arts in Legal Studies from the University of Central Florida.